The United States of America is such a large and diverse country that's full of many historic sites and picturesque nature, that state tourism boards sometimes have a hard time getting people to visit their beautiful state over the others. States like California, New York, Michigan and North Dakota use celebrity endorsements to get their point across, but Travel Oregon has opted for something different. The state’s new tourism ad, “Only Slightly Exaggerated,” emphasizes Oregon’s beautiful landscapes and bustling creativity with animation that feels like something straight out of Hayao Miyazaki’s Studio Ghibli. Hayao Miyazaki is one of the most famous Japanese animators in the world. As the founder of the world famous, Studio Ghibli, he was responsible for anime classics such as My Neighbor Totoro, Kiki's Delivery Service, Princess Mononoke, Spirited Away, and Ponyo. Miyazaki's animation style certainly has elements that are exaggerated for both creative, stylistic and thematic effects. As such, this campaign from Travel Oregon pays homage to that, starting with its title, "Only Slightly Exaggerated." After seeing the video ad, you will most certainly see the exaggeration of everything from color, size, facial expressions, etc... The video is brimming with big rabbits, serene fishing spots, newspaper-reading frogs, a bearded cloud man, and whales swimming among the cumulonimbus. "Slightly" might be stretching things a bit, but the video ad is absolutely beautiful and it will definitely makes you want to pack our bags and catch the next flight to Portland International Airport. The ad also pays homages in other, more subtle ways that only Miyazaki fans would appreciate. 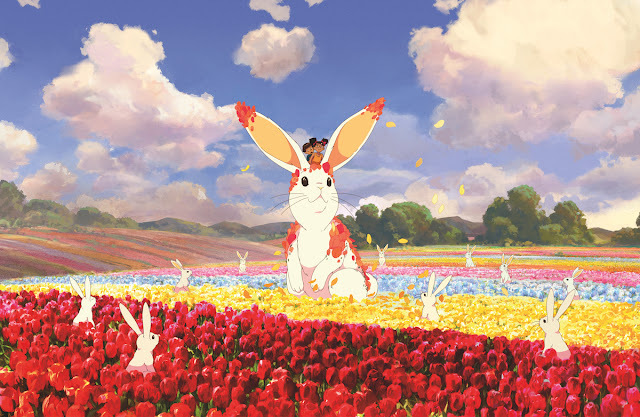 For example, The opening sequence is set in a lush woodland not unlike the spirit forest from Princess Mononoke; later, kids ride a giant rabbit through a field of flowers like they’re taking Catbus in My Neighbor Totoro. The spot even ends with a young woman lying in grass and looking up at the sky, just like the opening to Kiki’s Delivery Service. According to Travel Oregon's director of global communications, Linea Gagliano, the Miyazaki influence was not accidental, and that harkening back to his work just felt right to them. "It definitely did come from inspiration from anime experts like Miyazaki and Disney as well. We really felt like the Japanese anime style captured what we were going for and just felt more whimsical, fanciful, and felt like something that evoked the feeling of being in Oregon. Photos, while incredibly stunning and beautiful, don't capture the feeling of being in Oregon... That's part of the reason that we went with animation... We definitely wanted it to be original, but wanted to evoke that same feeling we all had when we watched those anime films." Travel Oregon’s website offers viewers real-life resources to follow up on the commercial’s wonder. Those intrigued by the giant flower rabbit ride, for instance, can check out a page with information about Oregon’s flower festivals and wildflower hikes, while fans of the forest scene can find out about Oregon’s hiking trails and scenic byways. “Only Slightly Exaggerated” was written and produced by Wieden + Kennedy, animated by Psyop & Sun Creatures Studio, and scored by Oregon Symphony.